Every plant has useful characteristics which Allah has inserted in it. Some tree crops are of much value because its every part (leaves, stem, seeds, roots) has equal worth and moringa is among those plants. In science, it is called Moringa oleifera. In Urdu, it is called Sohanjna. It belongs to family Moringaceae. Its origin is reported in Indo-Pak regions. It is used as a vegetable. 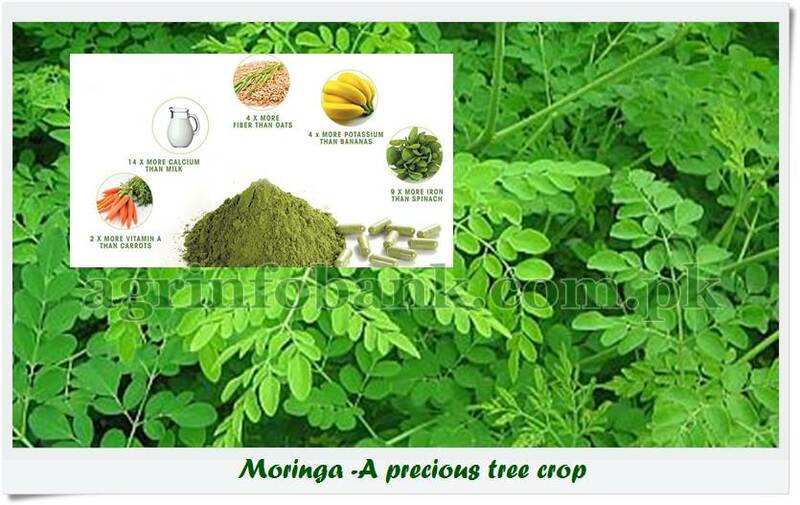 Moringa plant has extraordinary uses in herbal medicine and in allelopathy. This plant is used for centuries due to its nutritional aspects. Himalayan region is famous for its wild cultivation. It is settled in tropical and subtropical areas in the word. Now comes towards it propagation. It is propagated both sexually and asexually. By asexual propagation, it means stem cuttings are used for propagation purpose so mature stems or branches are used. There are different steps i.e., initially, we take a mature stem or branch of about six feet long and two inches thick. Then insert two third part of cutting in soil, sand and compost preferably green manure and affirm the cutting from the base to avoid shaking. Provide proper moisture conditions. There is another way that through sexual propagation means through seeds. One of the advantages of seed is that naturally, it has no dormancy. We can sow it nursery and trays can also be used. Its seed germination is up to 90-100 percent. For moringa cultivation light sandy loam and well-drained soils are considered best. Waterlogging and high rainfall are dangerous for it. Let’s move towards its health benefits. Moringa seed oils are beneficial for our skin and hair growth. This oil has agents for detoxify free radicals and have the hydrating ability for skin and hair. Its oil has protein contents that make it more beneficial. It is helpful in treating skin infection sores. For curing edema is always being a problem when fluids rise in some tissues. Due to its anti-inflammatory characteristics, it is helpful in this regard. The liver is our sensitive internal organ in the body. Its protection and repair against anti-tubercular drugs are giving moringa a pride. Moringa has found its importance in the treatment of cancer as it has a compound named niazimicin a precious chemical in checking cancer cells from further damage. There are various stomach disorders which our body face. Extracts of moringa is found useful in curing constipation gastritis, and ulcerative colitis. It has the capability to destroy numerous pathogens and have a sufficient amount of vitamin B. Our body is always facing complaints of bacterial and fungal diseases. It has antibacterial and antifungal properties to cope with it. Some elements like Ca and P are responsible for bone health. Moringa plants have rich in these elements making bone strong and curing arthritis. Moringa is useful in controlling some of our mood characters or feeling like depression, anxiety, and fatigue. Moringa contains such antioxidants which give heart protection from damage and maintain our cardiovascular system. It helps to heal and save to make scars sign at a spot of wounds. Moringa use has shown to reduce glucose level in the blood making it useful for diabetic’s patients and give urine a normal condition. Enhance hemoglobin and protein level in the body. Its extract is very supportive in treating asthma and save our bronchial construction. It has very low fat and cholesterol making it safe for our health. Moringa has anti-fertility qualities and is, therefore, avoid its use by pregnant women. There have been very rare side effects stated. So, we should consult it in severe conditions and use it according to doctor advice. Due to unique chemistry of compounds in the extract of moringa, it is popular in horticulture as medicinal and vegetable, agronomy and forestry. The government should encourage its cultivation and conduct seminars for its public awareness.